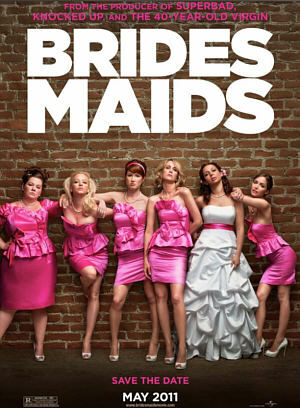 If you want to see a good chick flick comedy and have a good laugh, Bridesmaids is that movie. The plot is centered on a lonely and broke Annie (Kristen Wiig) who is asked by her childhood friend Lillian (Maya Rudolph) to be her maid of honor. At an engagement party Annie finds out that Lillian has another best friend, the successful and rich Helen (Rose Byrne), who is also going to be one of the bridesmaids. The competition begins between the both of them right away. Throughout the movie, Annie tries to pull off her maid of honor duties the best that she can, but Helen has other stuff in mind and is one step a head of her. There are very funny scenes in this movie. Like when the bride and the bridesmaids are trying on the dresses and all of them, except Helen, gets food poisoning. You can imagine what happens next. Also, the airplane scene was hilarious. You just have to watch the movie to see what happens, if you haven’t already. Everybody becomes friends at the end of the movie. Fun fact of this movie is that it was written by the actress that played Annie, Kristen Wiig. Will “Bridesmaids” Get A Sequel Without Kristen Wiig? Comments for Bridesmaids DVD Review are now closed.